1. The product's service voltage is 12V DC. Please do not connect directly without 12V power adapter (included in kit). 2. With an IP65 rating, the LED strip can be used in an outside setting and are water-resistant, but they are not waterproof and are not suitable to be submerged. 3.When using it, the remote controller should direct to the receiver within 5 feet without blocked. In order to avoid damage to the controller, light strip length should be no more than 33ft. 4. Outgoing line should be correctly connected according to wiring diagram provided. Controller's input terminal should be red positive pole, black negative pole. The arrow on controller's output terminal should be consistent with arrow on light strip. Please do not connect reversely. If light strip is only in blue light and cannot change color, it means that red black line on the input end, the line of output end and light strip are reversely connected. Adjust it to correct connection. It will work properly. 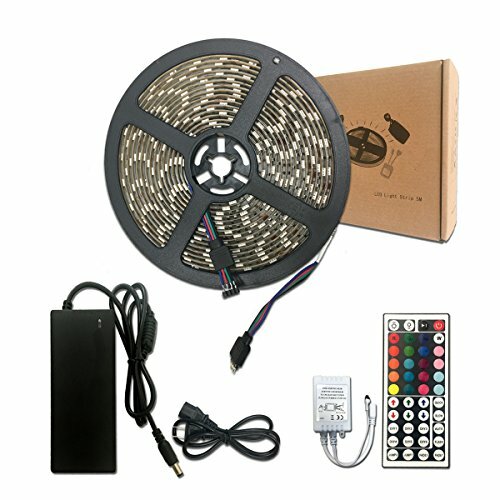 All in one kit: Comes with an adapter, a reel of 16.4ft 300 LEDs Waterproof rope light and a mini IR remote. Safe and reliable; Self-adhesive back with better adhesive tape for easy application, Super viscosity and easy installation. Cut-table and link-able: Color changing LED Strip Lights can be cut at cut marks, extra connector is required to link them(connector not provided). Its 5M adhesive tape backing can fit many dry flat surface. Durable & Waterproof: IP65 Waterproofed. Only LED strips are waterproofed. Remote controller, power adapter and connectors are non-waterproof. Save effort and maintenance costs on changing lights frequently. More than 50000 hours service life. Performance Guarantee: Comes with a full 12 month warranty, 30 days money back guarantee. If the power adapter or other accessories do not work, please contact us for help. Connect the load and power lines, make sure all connection right before power switched on; Insure there is no obstacle between the IR controller and the receiver when operating; Take off the plastic sheet of remotes battery before using. Energy Efficiency & Safety: 12V low working voltage durable power supply, 5A could support multiple lights as extension. More security and stability extremely low heat. If you have any questions about this product by RP LED, contact us by completing and submitting the form below. If you are looking for a specif part number, please include it with your message. ADJ Products UVLED48 Startec Blacklight Bulb, 48"